(Nanowerk News) Researchers have found an easy way to produce carbon nanoparticles that are small enough to evade the body's immune system, reflect light in the near-infrared range for easy detection, and carry payloads of pharmaceutical drugs to targeted tissues. Unlike other methods of making carbon nanoparticles - which require expensive equipment and purification processes that can take days - the new approach generates the particles in a few hours and uses only a handful of ingredients, including store-bought molasses. The researchers, led by University of Illinois bioengineering professors Dipanjan Pan and Rohit Bhargava, report their findings in the journal Small ("Tunable Luminescent Carbon Nanospheres with Well-Defined Nanoscale Chemistry for Synchronized Imaging and Therapy"). 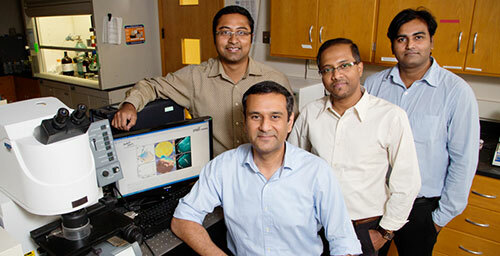 University of Illinois postdoctoral researcher Prabuddha Mukherjee, left, bioengineering professors Rohit Bhargava and Dipanjan Pan, and postdoctoral researcher Santosh Misra report the development of a new class of carbon nanoparticles for biomedical use. "If you have a microwave and honey or molasses, you can pretty much make these particles at home," Pan said. "You just mix them together and cook it for a few minutes, and you get something that looks like char, but that is nanoparticles with high luminescence. This is one of the simplest systems that we can think of. It is safe and highly scalable for eventual clinical use." These "next-generation" carbon spheres have several attractive properties, the researchers found. They naturally scatter light in a manner that makes them easy to differentiate from human tissues, eliminating the need for added dyes or fluorescing molecules to help detect them in the body. The nanoparticles are coated with polymers that fine-tune their optical properties and their rate of degradation in the body. The polymers can be loaded with drugs that are gradually released. The nanoparticles also can be made quite small, less than eight nanometers in diameter. "Our immune system fails to recognize anything under 10 nanometers," Pan said. "So, these tiny particles are kind of camouflaged, I would say; they are hiding from the human immune system." The team tested the therapeutic potential of the nanoparticles by loading them with an anti-melanoma drug and mixing them in a topical solution that was applied to pig skin. Bhargava's laboratory used vibrational spectroscopic techniques to identify the molecular structure of the nanoparticles and their cargo. "Raman and infrared spectroscopy are the two tools that one uses to see molecular structure," Bhargava said. "We think we coated this particle with a specific polymer and with specific drug-loading - but did we really? We use spectroscopy to confirm the formulation as well as visualize the delivery of the particles and drug molecules." The team found that the nanoparticles did not release the drug payload at room temperature, but at body temperature began to release the anti-cancer drug. The researchers also determined which topical applications penetrated the skin to a desired depth. In further experiments, the researchers found they could alter the infusion of the particles into melanoma cells by adjusting the polymer coatings. Imaging confirmed that the infused cells began to swell, a sign of impending cell death. "This is a versatile platform to carry a multitude of drugs - for melanoma, for other kinds of cancers and for other diseases," Bhargava said. "You can coat it with different polymers to give it a different optical response. You can load it with two drugs, or three, or four, so you can do multidrug therapy with the same particles." "By using defined surface chemistry, we can change the properties of these particles," Pan said. "We can make them glow at a certain wavelength and also we can tune them to release the drugs in the presence of the cellular environment. That is, I think, the beauty of the work."